At walkzee we are committed to developing the first platform where dog lovers can search their local area for shelter dogs who need a walk - then schedule a day out for them both to enjoy! But as we are pre-launch and currently Kickstarting, we thought we would break down some popular vacation spots across the United States that are beautiful, and also have awesome shelter dog field trip programs to give you and a shelter dog a wonderful day out! Not only is Kauai one of the most beautiful and majestic places to visit, but they also happen to have a great field trip program that allows visitors to walk a shelter dog at the beach, on a walk, or a hike anywhere on the island - as long as they back before closing hours. The program is so successful, that Kauai Humane Society's alumni now reside in 25 different states, and 4 different Canadian provinces from adoptions from visitors to the island. 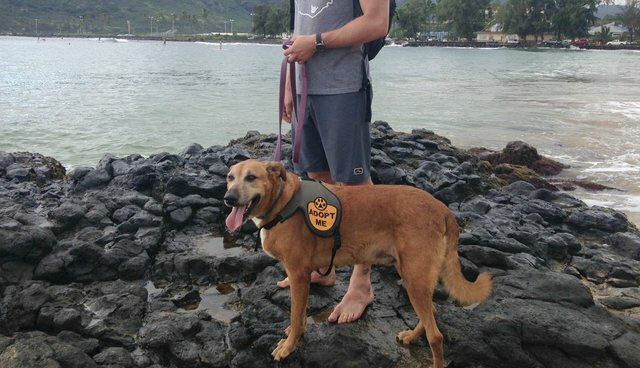 Kauai Humane Society estimates over 100 dogs have been adopted as a result of a successful field trip, and more from people who have seen a shelter dog on a field trip. Located in the southern canyons of Utah, Best Friends Animal Society is a beautiful and vast sanctuary where the no kill animal shelter has built an animal safe haven to heal homeless pets. What is most unique about this sanctuary that sits among beautiful red rock canyons, is they have a sleepover program! Visitors can share their hotel, cabin, cottage, or RV with a dog for a night - keeping the fun going long after a day of exercise. Visitors who do sleepovers are able to share with Best Friends what the animal's behavior is like in a one-on-one situation in a home-like environment - behavior that may be very different from when they are locked in their cage in the shelter. This helps Best Friend place the dogs in a perfectly matched environment! Austin, Texas is one travel destination that has so much to offer. Whether its their music festival SXSW or Austin City Limits, or you are looking for a much more liberal side of Texas with food trucks, strong coffee, and eccentric cocktails - Austin is nothing short of fun things to offer. If you are in the area and you are missing your pup, or want to explore with a furry friend, Austin Pets Alive lets volunteers walk shelter dogs and they even support a running program called "Rufftail Runners" which let's you run a dog at nearby Lady Bird Lake. Our next trip is already planned! Sun, sand, and waves. That is what you get most days of the year when you visit sunny San Diego. What else can you do in San Diego? You can exercise with a rescue dog! Yes, ladies and gents, San Diego shelter The Barking Lot supplies rescue dogs to people who want to join the Peakfinders K9ers, a group that is "focused on exercising with your pooch." How else are you going to burn off the calories from that Ballast Point Sculpin IPA so you can still look great in your swimsuit? Most people visit Washington DC so they can take in views of the national monuments, or try to get a peek at the president, so we were very excited to learn about a shelter dog exercising program from the Washington Humane Society called PACK (People and Animal Cardio Klub). PACK is a group of volunteers, who is always taking new members or visitors, that meets at local parks to run, walk, or play with adoptable dogs from the shelter while they are waiting for their forever homes. Explore the scenes and take in some fresh air while also walking a shelter dog! I don't know about you - but I think I am ready to plan my next vacation - and luckily I can plan knowing there are places where I can enjoy the scenery and have fun with a shelter dog. Do you know of any more programs like these in your area? Let us know! We would love to add more cities to our bucket list.